MaríaJosé Padgett finds inspiration in her world travels to design handcrafted silk blouses, beaded bangles, and statement earrings. MaríaJosé Padgett is one to watch. At age 21, with no formal design training, the Honduras-born entrepreneur and Southern Methodist University graduate launched ZINDAGI, a line of traditional Indian earrings designed in Dallas handcrafted in India. 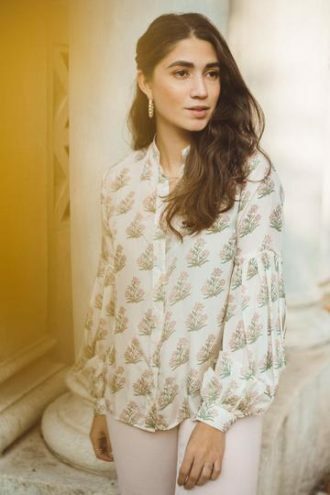 Five years later, the ZINDAGI line encompasses clothing (think off-the-shoulder dresses, patterned chanderi silk blouses, and swingy cotton tops), more jewelry (from bangles to rings, adorned with hand-painted enamel spheres), and a steadily growing global fanbase. We caught up with Padgett to discuss ZINDAGI’s origin, her sources of inspiration, and her advice to aspiring designers. How did ZINDAGI get started? ZINDAGI started after love took me to India for the first time in 2014. My ex-boyfriend’s mom is a former Indian supermodel and now a fashion designer, and she took me to my very first fashion week where I fell in love with the intricacies of Indian fashion and everything it represents. A couple of days later, I went to a market in Delhi and bought my very first pair of jhumkis (a traditional earring style). I can’t explain how excited I was to see them. I had never seen anything like it in my native country, Honduras, or here in the US. I was encouraged to bring some pieces back to the US and Honduras and try to sell them to make some extra money while I was in college. I really liked the idea, yet knew I didn’t want to just sell pretty, exotic pieces, I wanted to create a brand. Over time, I immersed myself in the rich history, designs, and production process of Indian jewelry, and in 2017, I launched my first jewelry collection, as well as my first apparel line. The word Zindagi means “life.” I first heard it in the Bollywood movie title Zindagi na Milegi Dobara, which means “life doesn’t repeat itself.” It was so perfect, because all the pieces are one-of-a-kind. Where do you gather inspiration for your pieces? Definitely my travels, but all in different ways. In Spain, it’s the architecture, especially Andalucía. In Latin America, the people inspire me. In Asia and India, it’s the culture that keeps me going. I enjoy designing pieces that transport me to exotic places. Where are your products designed and made? What is that process like? All the pieces are made in various locations in India. When an idea comes to my mind I sketch it and save it for my next trip. Once I arrive, I immediately head to the studio to meet with the team and start working. The process involves a lot of “back-and-forth” designing between me and my team, and it generally takes a long time to get the piece exactly how I envision it. Sometimes designs looked way better in my head than in real life. To say I have shed a tear or two out of disappointment would be an understatement. It’s taught me patience and challenged me to create unique pieces that represent my style. What is your favorite thing about running your own company? Seeing my vision come to life. The relationships I’ve made around the world. It’s been incredible to meet my clients, and call them friends. I also work with artisans whom I truly call family (truly–I call them bhaiyya (brother) and didi (sister)). The freedom to travel and the inspiration I receive from visiting new places is also a huge blessing. Managing the brand and marketing it in two countries and cultures (Honduras and the US) and expanding to other countries in Latin America and Europe. Also, narrowing my design. I have so many sketches and ideas, but I can’t launch them all at once. What advice would you give to other aspiring female entrepreneurs or designers? I would advise other women to not be scared to try new things or visit new places. It’s very important not just to land somewhere exotic; actually immerse yourself in the culture. Get to really know the people. Traveling teaches us so many things (good and bad) about ourselves. It helps us define our style, our likes and dislikes, our goals, and it also opens many doors. My other advice is to not let people get to you. I think it’s very important to expect competition, copycats, and unsupportive people, but use that as an encouragement to move forward.